Over the last two years the field of minimally invasive surgery has seen the emergence of single port laparoscopic techniques. 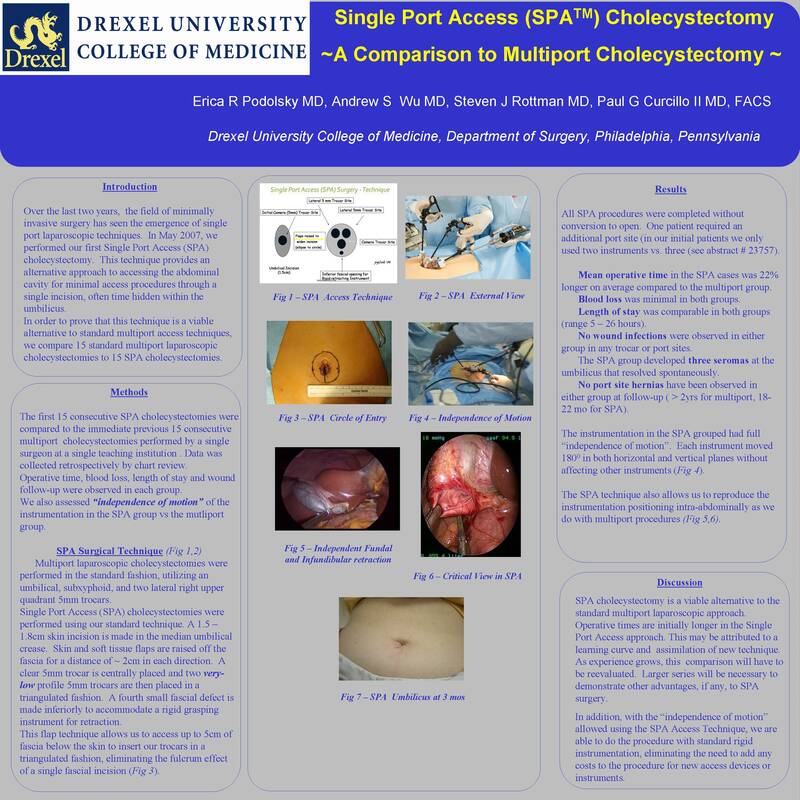 In May 2007, we performed our first Single Port Access (SPA) cholecystectomy. This technique provides an alternative approach to accessing the abdominal cavity for minimal access procedures. Additionally, it enhances cosmesis and decreases skin incisions. In order to prove that this technique is a viable alternative to standard multiport access techniques, we compare 15 standard multiport laparoscopic cholecystectomies to 15 SPA cholecystectomies. 15 consecutive multiport laparoscopic cholecystectomies and 15 consecutive SPA cholecystectomies performed by a single surgeon at a single teaching institution were analyzed. The fifteen SPA cholecystectomies were performed using our standard technique. Through a 1.8 cm initial incision, a clear 5mm trocar is centrally placed and two low profile 5mm trocars are then placed laterally by raising skin and soft tissue flaps. A fourth small fascial defect is made inferiorly to accommodate a rigid grasping instrument for retraction. Fifteen multiport laparoscopic cholecystectomies were performed in the standard fashion, utilizing an umbilical, subxyphiod, and two lateral right upper quadrant trocars. Data was collected retrospectively by chart review. Equivocal blood loss and length of stay were observed in each group. Mean operative time in the SPA cases was 22% longer on average compared to the multiport group. No wound infections were observed in either group. The SPA group developed three seromas at the umbilicus that resolved spontaneously. No port site hernias have been observed in either group. SPA cholecystectomy is a viable alternative to the standard multiport laparoscopic approach. Operative times are longer in the Single Port Access approach. This may be attributed to a learning curve, assimilation of new instruments and/ or technique. As experience grows, this will have to be evaluated. Larger series will be necessary to demonstrate other advantages, if any, to SPA surgery.